...AND A PRIZE DRAW OPEN TO UK BLOGGERS. I made this cake the same day I saw it on Sylvie's blog - A Pot of Tea and a Biscuit. I mean how could I resist? I am sure you have all experienced that immediate lust when you see a recipe and fall in love. Store cupboard permitting, it just has to be made the same day! It was serendipity! I was trying to decide which cake I should make and take along to my parent's house that evening and low and behold there it was in all it's sumptuousness! I changed it into cup measures, because I prefer baking this way now, but if you would like the cake recipe in metric, visit Sylvie's blog for the original recipe. 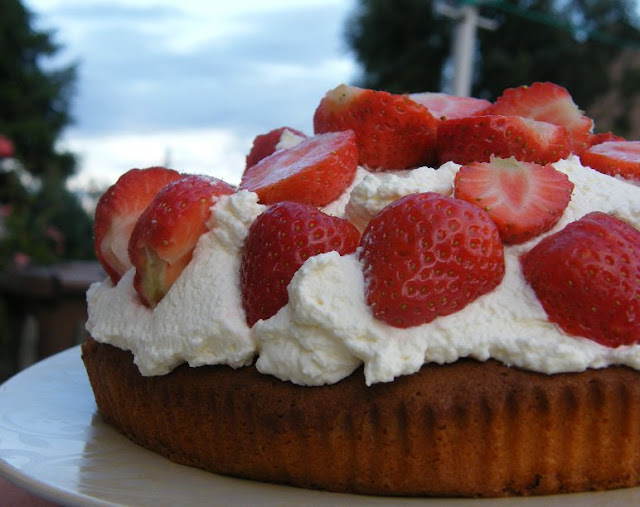 Once the cake has cooled, whip up the cream with the sugar and lemon juice and spread across the cake. Sylvie mixed some lemon curd and icing sugar into double cream for her cake, which sounds great too. Finally top with halved strawberries. Making this cake was a piece of cake, please ignore the pun! It was just so easy and quick to put together, but with stunning results. It got high marks from my parents and from Graham. Although Graham would have preferred the cream without the lemon juice, but then he is never a huge fan of lemon. On another note, I have just learned of a rather brilliant competition open to UK Bloggers. Those lovely peeps over at Gaviscon Double Action are offering fabulous prizes in their The Nations Favorite Double Act Competition. First Prize is a £200 voucher for two, to dine at Anthony Worrall Thompson’s restaurant, The Greyhound, in Henley-Thames, plus one night’s stay at the Hotel du Vin in Henley, and £100 toward travel expenses. 33 runners-up will receive a signed copy of ‘Fast Family Food’ by Anthony Worrall Thompson. Not bad as far as prizes go, huh? In a recent survey done by Gaviscon Double Action (a heartburn and indigestion remedy), they discovered that Apple Crumble & Custard is the nation’s favourite Double Act pudding. Now who is going to argue with that? It is perfect comfort food. Apparently, 58% of Brits admit that they would not turn down the offer of a pudding under any circumstances and 16% of men are eating their favourite pudding once a month compared to 17% of women. Those poor men musn't have a food blogger living with them or I am sure the percentage would be much, much higher! All you have to do to enter this prize draw, is to choose from the 11 favourite puddings listed and then enter your details. It is too good an opportunity to miss! Wow, this cake looks wonderful. I have been in the mood for lemon desserts recently and this one, mixed with the strawberries, is probably just what I wanted. Thank you for the conversion! very pretty cake! I hope you win the drawing. Looks very good, and so much easier than the way I make lemon cake! Strawberries and cream. Can't go wrong there. Don't you wish there was just more time in the day to eat cake? Love it. Hi Davimack, That is what really impressed me about this cake straight off, it is so simple and I can vouch that this is true. Definitely not Joanne, or I would be the size of a bus! Hi! 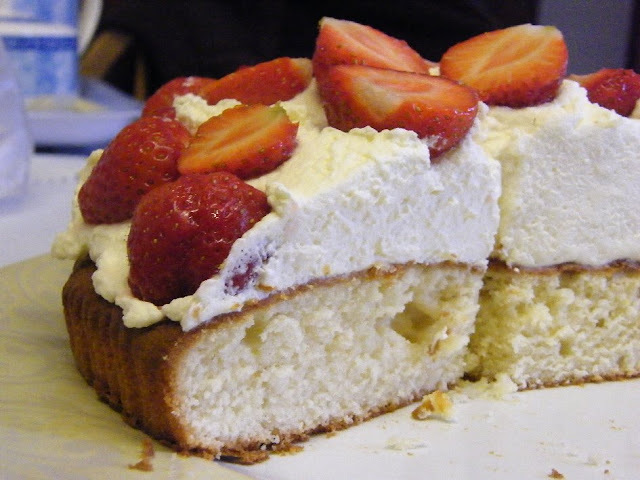 I have just found out yor blog and I really like this sponge cake with the cream and all, miam! And it looks soooo good!!! How pretty! I wished you were my neighbor;-)Lemon Cream & Strawberry is just divine. I love that gorgeous outdoor photo - that is summer coming into my loungeroom! That looks so sinful. The cream on top is a perfect fluff of cloud with little berried adorning it. You are awesome. THis could be a good idea to put my newly found vegan cream to more good use! The folks from Gaviscon expect a little heartburn from food bloggers, do they? LOL! That looks lovely! These are some of my favorite kinds of cakes. I love the combination of lemon and strawberries! Let me how how you get on with that Rose, it is always nice to offer people a dairy free alternative in recipes. Hi Lo, I would hate to go back to metric now. Stummbled my way into this delicious blog! It looks beautiful! :) Lemon is one of my fave flavours! I am with you A&N, I love cirus desserts. Oh wow Jacqueline this looks absolutely perfect! The cake looks yummy and soft and I looove all that whipped cream on top! I've never thought of adding lemon, sounds yummy. Lovely looking cake. I can't get on with cups and prefer weighing everything on scales. Thanks for the tip off about the competition...I think I'll head over and enter it now! Nice cake, sounds and looks very refreshing..very lemony...yummie! Oh my gosh, wow this cake looks and sounds amazing!! Hi Ashley, I actually prefer the cream with the lemon. I sometime find cream a bit sweet and sickly, but the lemon balanced it out, with a touch of sugar too. I don't think I could resist this cake either Jacqueline. I've never seen strawberrries and cream looking this good. I couldn't resist this either, I think. I can see how you would need to make that cake right away. The cream alone has my mouth watering. Jacqueline, thanks so much for the thumbs up on the cake. I hope you're well. I've just got back from three weeks camping in Scotland and need to get back into cooking, baking and blogging now! Hope you're well!